Pineapple (Ananas comosus) is a perennial plant of the family Bomeliaceae which embraces 2000 plant species. The plant is propagated by crowns or slips. Some propagators use suckers. Due to high sensitivity to pests and diseases, growers prefer to initiate mother plantations, and in some cases field plants, from in vitro propagation. The use of meristem culture alleviates the need to select material that is free from top rot (Phytophthora cinnamoni), base rot (Ceratocystis paradoxa), Fusarium wilt and other diseases. Rahan propagates disease free plants of the varieties Smooth Cayenne and MD2. 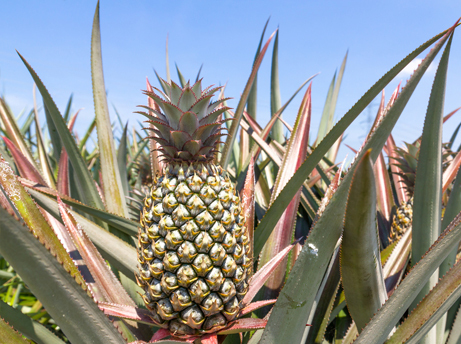 Our plants are tested for the viruses Pineapple mealybug wilt associated virus-1 (PMWaV1), and Pineapple mealybug wilt associated virus-2 (PMWaV2). Our material is tested and certified .